Be the first to share your favorite memory, photo or story of Artur. This memorial page is dedicated for family, friends and future generations to celebrate the life of their loved one. 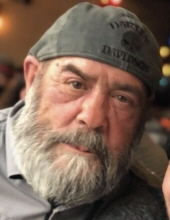 Artur Augusto Duarte De Oliveira, 66, passed away peacefully at his home in Hillside, NJ, on Saturday, February 2, 2019 with his loving family by his side. Artur was born in Lesa de Palmeira, Matosinhos, Portugal and came to the US in 1980, resided in the Ironbound Section of Newark before moving to Hillside many years ago. Devoted and loving father of Michael Oliveira and his wife Sandra, Michelle Marques and her husband Willie, Jennifer Simoes and her husband Nelson; dear brother of Manuel Oliveira and his son Sergio; cherished grandfather of Demetrios, Michael, Edgar, Christopher, Harley-Marie, Caleb, Emma, Noah and Seth; also survived by many dear relatives and friends from Rei da Manivela of Elizabeth, NJ. The Funeral Mass for Artur will be held on Wednesday, February 6, 2019 at 9:30 AM at Our Lady of Fatima Church, Newark, NJ. Interment Holy Cross Cemetery, North Arlington, NJ. Relatives and friends are welcome to attend. To send flowers or a remembrance gift to the family of Artur A. Oliveira, please visit our Tribute Store. "Email Address" would like to share the life celebration of Artur A. Oliveira. Click on the "link" to go to share a favorite memory or leave a condolence message for the family.